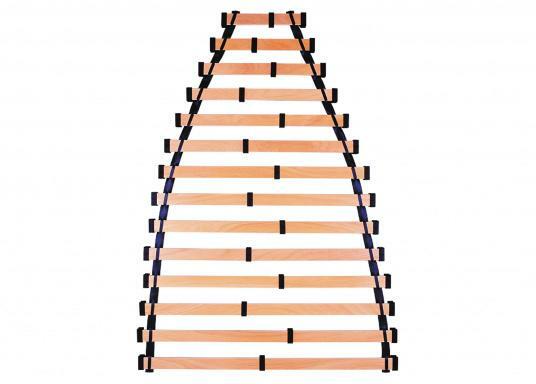 Flexible slatted frame, easy to assemble. Adjustable to fit all bunks. The BEDFLEX system provides sleeping comfort like at home. Thanks to an easy assembly with measuring tape and handsaw, this portable slatted frame can be adjusted to fit any berth/bunk shape on boats and caravans. The bed system offers maximum sleeping comfort, at all times. 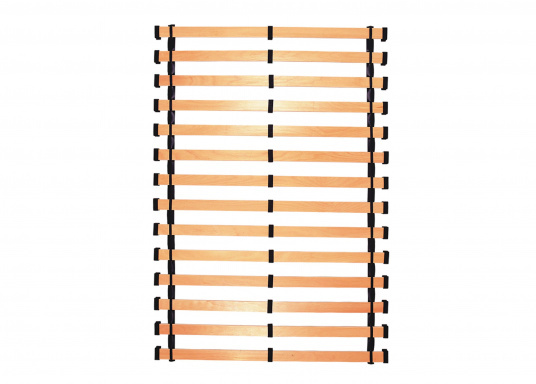 Slats can be adjusted with a handsaw. Any space can be transformed into a bed at night with the mobile BEDFLEX Marine. During the day, your slatted frame gives excellent seating comfort. Very easy to install under pillows and mattresses. Sleep healthy without moisture and mildew under your foam mattress. The slatted frame adapts totally to the bodies contours, ensuring a good night's sleep. The sliding rubber pads can be adpated to the respective body weight over the whole length of the body. 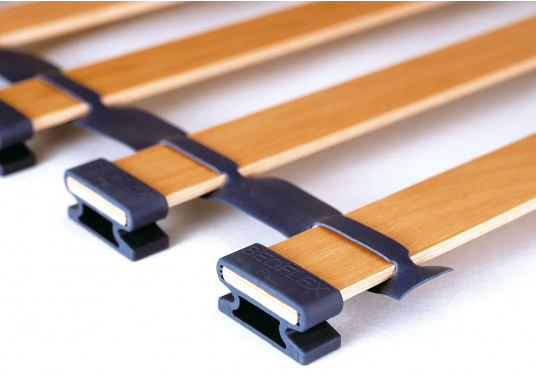 Features unidirectional woodgrain for optimum elasticity and resistance. 3 years manufacturer's warranty. Is the model 70421, BEDFLEX - Bed system / 160 x 200 cm with a V shape or only in a rectangular shape? It's delivered rectangular shape but was rather easy to saw needed V-shape. Takes app. 1 hour to saw and assememby whole packet. Dear Jan-erik, the height of the rubber pads are 35mm. Your SVB-team. Verarbeitung ist gut. Ist schnell aufzubauen und anzupassen. Einfach zu montierendes System, ein wenig Schreinerarbeit und der Rost ist montiert.